Bumblebee - 4K UHD Review - ReDVDit! 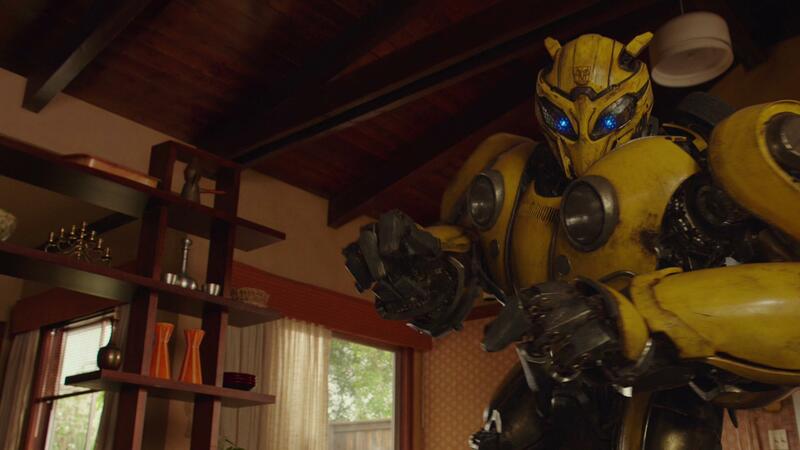 Bumblebee is a 2018 American science fiction action film that is centered on the Transformers character of the same name. It is the sixth installment of the live-action Transformers film series. It was developed as a spin-off and a prequel, and later declared to be a reboot of the franchise. 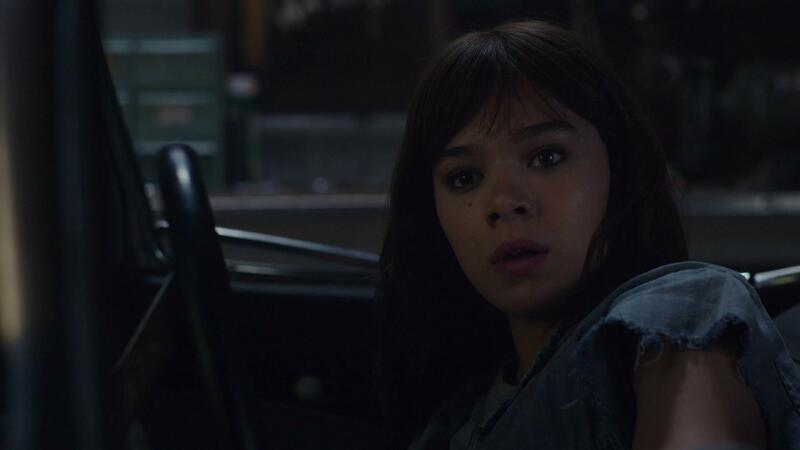 Directed by Travis Knight and written by Christina Hodson, the film stars Hailee Steinfeld, John Cena, Jorge Lendeborg Jr., John Ortiz, Jason Drucker, and Pamela Adlon, with Dylan O’Brien, Angela Bassett, Justin Theroux, and Peter Cullen in voice roles. It is the first live-action Transformers film to not be directed by Michael Bay, and Knight’s first live-action directorial debut. Principal photography on the film began on July 31, 2017, in Los Angeles and San Francisco, California. 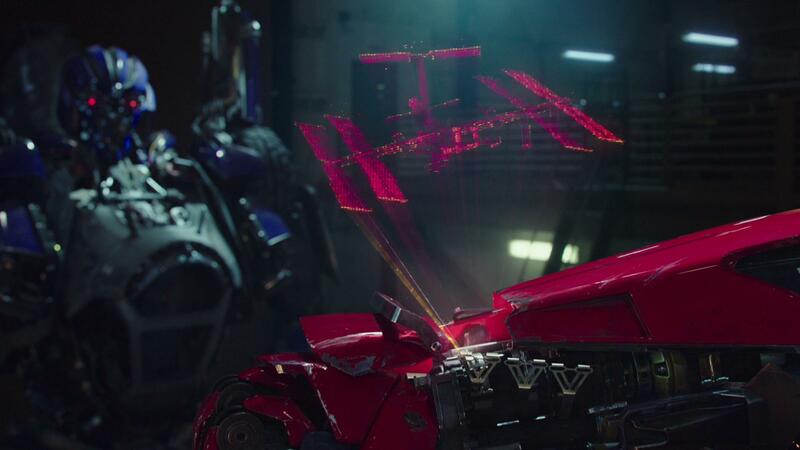 Characters from the previous films returning include Bumblebee, Optimus Prime, Ironhide, Ratchet, Arcee, Wheeljack, Starscream, Shockwave, and Soundwave. Starting off on Cybertron, the Autobot resistance, led by Optimus Prime, is on the verge of losing the civil war against the Decepticons, and they prepare to evacuate the planet. A Decepticon force that’s lead by Soundwave and Shockwave intercepts them during the evacuation, and Optimus sends the scout B-127 to Earth on an escape pod in order to set up a base of operations where the Autobots can regroup. 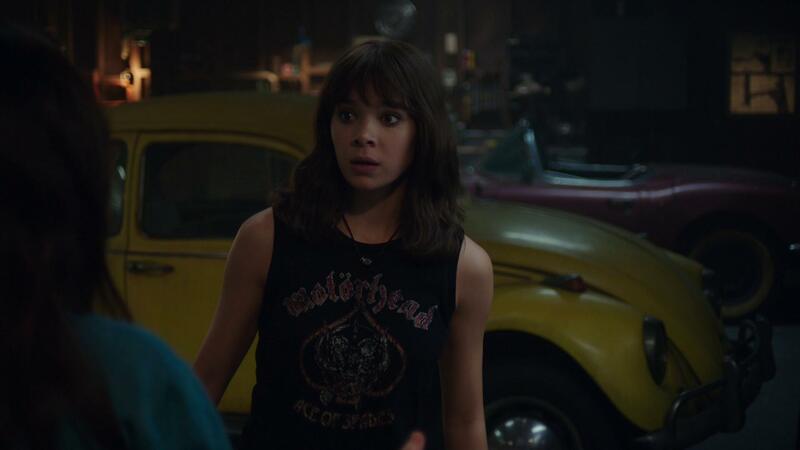 Bumblebee premiered in Berlin on December 3, 2018, and was theatrically released in the United States on December 21, 2018, and grossed over $459 million worldwide. The film received generally positive reviews from critics, who praised the action, and Steinfeld’s performance, as well as the 1980s setting and sense of nostalgia, with many calling it the best installment of the Transformers franchise to date. Regardless of the amount of disdain that’s been out there for the movies of the Transformers franchise, they’ve always been a series that I can sit down to and enjoy without a single care in the world. 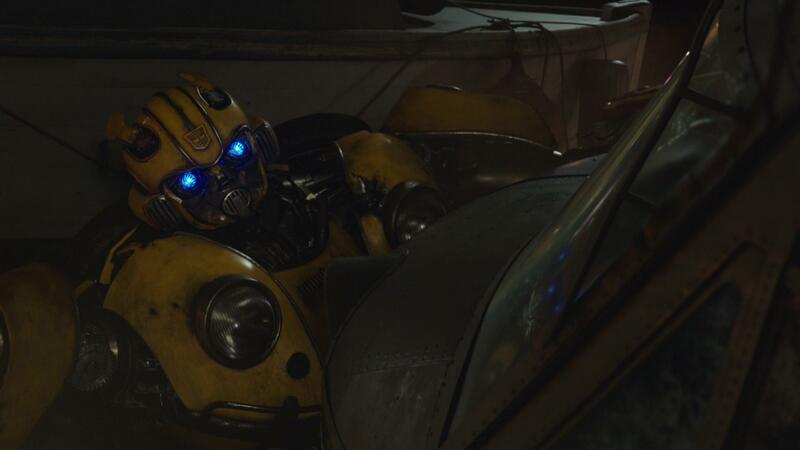 While they’re full of mindless explosions, the announcement of Bumblebee and the fact that they’ve been re-thinking the universe as a whole definitely had my interest piqued. This movie gives its viewers an experience that’s unlike any of the previous films, allowing for the character development to move more naturally, and really take its time to tell its story. Paying a significant amount of homage to the television franchise, and original animated film, this movie ultimately proves to the world of Hollywood that it’s not all that difficult to make a good movie that has a sense of nostalgia to it. My wife and I thoroughly enjoyed this movie and everything that it had to offer, and are certainly looking forward to what the future for the Transformers movies will hold. While Bumblebee was finished off with a 2K digital intermediate, where this release shines is with its use of Dolby Vision and HDR. The visual presentation certainly offers a noticeable and unique experience that can only be had with this format as the boost in textures and colors are simply excellent from start to finish. The improvements to the depths when utilizing Dolby Vision are much more saturated, and do a fantastic job at enhancing the image, particularly when it comes to our mechanized friends. The distinct colors of the Autobots, even when they may have some layers of dirt on them, really boast a presence that not only makes them stand out, but ultimately makes them feel as if they’re physically right there. 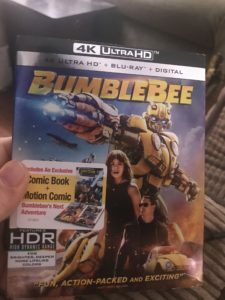 Bundled with an English Dolby Atmos audio track, the UHD release of Bumblebee offers an absolutely insane and immersive audio experience for its viewers that are setup to use Atmos at home. With its intensive surround integration, and overall use of the overhead elements, my wife and I simply sat there in awe as we watched along. Our favorite part was the notoriety of the bass elements, as my living room floor vibrated like crazy. There are a few moments where it feels that the depth of the scene overpowers the finer elements; but it isn’t too terribly distracting. The dialogue is spoken cleanly, and the characters are easily able to be understood without any kind of added focus, or the need to manipulate the volume controls as it progresses. 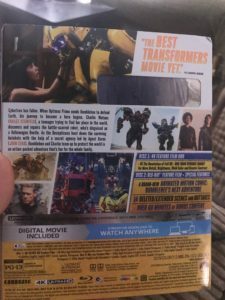 Bumblebee comes packaged in the standard two-disc amaray case. In the case, the standard UHD copy and standard Blu-ray copy, neither disc featuring any artwork outside of the standard release text. There’s a digital copy redemption pamphlet and a slipcover with matching cover art. There is also a physical copy of the Sector 7 comic book included. Sector 7 Archive – Two small featurettes, one where John Cena’s character introduces new recruits to the agency; while the other, is the motion comic version of the physical comic included with this release. Bee Vision: The Transformers Robots of Cybertron – The opening war scene is periodically paused to show which Transformers are taking part in the battle. Overall, my wife and I absolutely loved Bumblebee and are genuinely excited to see where things go from here. The visual and audio presentation of the 4K release were insane, and offered one of the better performances I’ve seen on the format recently (specifically for newer films). The bonus features, while it’s a shame there weren’t any on the UHD but, this is a common trend since the release of the format. If you’re looking to add this to your collection, I’d definitely recommend picking it up on 4K. 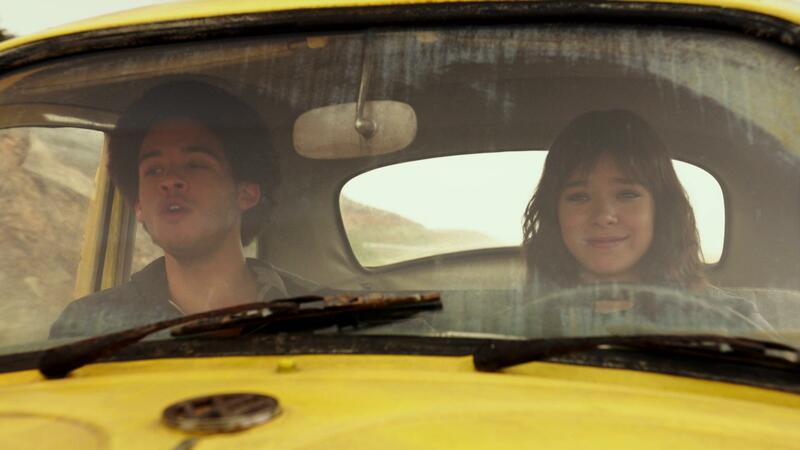 Bumblebee will be available on 4K UHD, Blu-ray and DVD beginning on April 2.